We’re seeking contributors to the College of Law Practice Management’s Futures Conference, to be held in Nashville in October 2019. We’ve issued a Call for Speakers (show us how you’ve embraced the future), a Call for Ideas (tell us what you want to learn about), a Call for Fellows Updates (if you’re a Fellow of the College, tell us about your latest innovative contribution) , and a Call for Musical Talents (we’re looking for ways to showcase the best and brightest the legal profession has to offer). What constitutes a good “pitch” to win legal work? This is a recurring discussion among legal marketing professionals, due to the large volume of pitches that every law firm produces. And there are indeed many good ideas and best practices to be embraced. However, the first best practice when it comes to pitches is to stop doing them! Nobody likes to be pitched. What clients need are business partners who solve business problems. So stop doing "pitches" and instead focus on addressing your client's business needs. Let’s discuss how. In the Biglaw legal marketplace, it's taken as gospel that loyalty is dead. Corporate clients that once retained the same law firms over a multi-year period may now issue RFPs and shift the work to lower-priced firms. Partners with solid and portable client relationships may leap to new firms offering more generous compensation packages. Associates with certain pedigrees are test-driving their newly-rediscovered market appeal and selecting employers who will pay above-market rates. These changes are arguably a healthy reflection of a dynamic and competitive marketplace. One thing that hasn't changed, however, is that all of these changes are preceded by triggers; they don't just occur spontaneously. For examples, clients who change law firms always signal their dissatisfaction, though sometimes you have to watch closely to see the signs. I'm baffled why any law firm relationship partner is surprised when a new General Counsel or new Chief Executive Officer predictably launches a cost-cutting initiative or brings in trusted advisers from a prior life. Why is it a surprise when a longtime client demands rate discounts several months after implementing a new e-billing system? When a client or prospective client issues an RFP and invites its procurement or finance team to the negotiation, why are law firm partners surprised to discover that alternative fees or discounts may be a necessary factor in winning the work, and not just pedigree or length of relationship? Some years ago in my corporate life my team established a "risk index" for our key clients, incorporating several independent factors that, when viewed in isolation, were mildly helpful indicators of satisfaction. However, when viewed collectively, these factors were surprisingly accurate in predicting when a valued client relationship was at risk, allowing us to be proactive in our retention efforts. This wasn't rocket science. We simply looked at factors like our contract terms (were they paying higher than average prices? ), and depth of relationships (did we rely on one well-placed "friend in court" in the client organization, or had we established relationships at all levels? ), and product penetration (did the client invest in numerous offerings or was our relationship limited to a single product or service), and product reliance (did the client have mission critical business processes relying heavily on our services, or were we in the "nice to have" category? ), and even our own loyalty (has our sales and service team been consistent, or are we constantly re-assigning people and confusing the client with who to call? ), and more. Two factors were highly correlated with risk, or a potential change in circumstances in our relationship. One was a change in our primary contact. The other was a notable change in the client's financial performance. When our primary contact changed, this nearly always led to a review where we had to defend the investment in our service offerings. And if the client or its parent organization had a bad year, even in an area totally unrelated to the line of business we were in, this nearly always led to belt-tightening that would sooner or later impact us. As a result of this ongoing analysis, my team was rarely surprised. We developed a proactive toolkit when one of our key client relationships was flagged as high risk. And the clients loved it, because we often offered some creative solutions before they had formulated an attack plan, and in some cases, before they even were consciously aware that changes were needed. Who was unhappy? Our parent company, whose executives rejected any notion of proactive renegotiation because the only indicator of a relationship at risk that they would accept was an outright cancellation! This probably sounds familiar to many law firm leaders who hear soothing words from relationship partners of key clients until <gasp!> the client suddenly defects, or fades away without ever lodging a formal complaint. "But they love(d) us," the partner in charge will claim, all evidence to the contrary. I was recently reviewing an old article in which I shared an instance of proactive service recovery by my preferred airline at the time, Continental. My closing remarks were prescient. Frequent fliers have certain buying triggers, and when an airline stops rewarding loyalty, the frequent fliers stop being loyal. Continental merged with United several years later, and, as loyal Continental fliers anticipated, the combined airline took on the service posture of United which is, shall we say, more focused on "What have you done for me lately?" than "Thank you for your many years of loyalty." "Over the years I have flown to a lot of places. As a result I have earned many miles and points from various airlines, hotels, rail lines, car rental companies and other assorted vendors to the business traveler. I have countless horror stories. You've all heard them. Or something like them. It's part of our culture to mock airport security, or express frustration at airline pricing, or bemoan the inattentiveness that leads to lost baggage and is compounded by further inattention in returning it. But today I won't discuss what's gone wrong. I'll mention a couple incidents that went right. Continental Airlines lost my bag last week. More accurately, I had 12 minutes to make a connection in Houston and I made it but my bag didn't. When we arrived at the final destination, the gate attendant came on board and paged me, asking me to see him as I stepped off the plane. He apologized that my bag didn't make it. He gave me the specific name of an agent in the baggage service office who was waiting for me, ready to complete the lost bag forms. Since I was awaiting a colleague on a later flight, I first stopped at the food court and had lunch. Apparently I was paged several times in baggage claim, as I received calls and text messages from alarmed friends. Then I received a call on my cell phone. The baggage service agent had called my home, explained to my wife that she wanted to help me expedite my claim, and asked for my cell phone number. I spoke to the agent briefly, stopped by the baggage claim office to fill out the form, and in about 4 hours the bag was waiting for me at my hotel. Two days later I received a letter in the mail from Continental, apologizing for the mixup and thanking me for being a customer. Last year was my lightest travel year in over a decade. This was a blessing. But also a curse. Veteran travelers know that losing "elite" status means waiting in long lines with extended families, students, sports teams, foreigners baffled by the cacophony, and vacationers. As it turns out, I flew just enough to finally attain Million Miler status on Continental, which earned me lifetime elite status. I received a nice letter, a few related tokens of appreciation, and another thank you for my business. At the exact moment I expected to have no priority status while traveling and would therefore be more of a price shopper than a brand loyalist, Continental secured my loyalty. Again. This is even more pleasing because several years ago I asked Continental -- the reason why now escapes me -- for a running tally of my earned miles. The agent who responded via email was curt: "We don't divulge that information except by court order." I forwarded the unusually hostile email to the head of OnePass, the loyalty program, who immediately apologized, provided the necessary information, and thanked me for my business. I suspect the customer service agent also received a scolding for not reflecting the proper service posture. There are two lessons here for law firm leaders. One: identify the change triggers that are likely to signal a potential change in circumstance with your client's buying patterns. Better yet, build this into a predictive index and apply it regularly to all clients that you wish to keep. Two: develop a proactive response for at-risk clients. The triggers vary, so the responses will vary. But the earlier you act, the greater the chance to salvage or even rejuvenate the relationship. You're going to hit some roadblocks. Relationship partners tend not to like anyone looking over their shoulder. And data is hard to come by. And developing a collaborative response plan is a challenge in an organization where collaboration isn't necessarily rewarded. But do it anyway. On occasion will you "poke the bear" and provoke a "Hey, we hadn't been thinking about you lately but now that you mention it, we're unhappy" response? Sure. But I'd rather control that conversation and stay involved in designing the outcome than have my competitor provoke the conversation unbeknownst to me. Loyalty isn't dead. It just needs some attention. When should a law firm develop its own software? Okay, fine, perhaps some explanation is in order. While the above conclusion may seem obvious to me and to many others, whenever I make this assertion on Twitter or from a podium, more than a few people will question my sanity or try to uncover my hidden bias. My bias isn't hidden at all. My view is developed from a lifetime of selling software, managing teams developing software, managing teams configuring and installing software, and managing teams buying and implementing software. Of course, the world isn't so black and white that one answer applies to every situation. But, by and large, law firms should practice law, not write software code. Here are 6 reasons why. You need to stay focused. Smart business leaders outsource when (a) the all-in cost of buying is lower than the all-in cost of building; or (b) when in-sourcing will divert needed resources from strategic imperatives to non-core, non-strategic functions. Just as corporations hire law firms - because investing in a huge law department to handle all legal needs would be more costly and disruptive than hiring on-call experts -- law firms should outsource their non-core activities. So a law firm CIO is better off purchasing software that can be configured to the users' needs or, at worst, hiring a software vendor to write code specific to the users' needs. Check your math. If your calculation suggests you should build vs. buy, you're likely doing the math wrong. The all-in cost, or total cost of ownership, isn't simply about software seat licenses, initial configuration, and ongoing maintenance fees compared to the sunk cost of Steve in the IT department who can write code. The all-in cost requires a broader look at the learning curve for common features/functions, R&D time for new features/functions, quality assurance and load testing, fixing bugs and releasing periodic patches, gathering ongoing user requirements, maintaining a product roadmap of features/functions having the widest impact to the user community, training users, providing front-end support such as password resets, providing second-level support for major bugs or conflicts, management reporting, and, oh yeah, coding. By the way, nowhere in your calculus or rationale should we find: "We have a software developer on staff and we need projects to keep him or her busy." Software purchases can be expensive. But it's short-sighted to view a vertical or enterprise application as solely a cost; it can be an investment too, with significant returns. Many organizations offset costs by demonstrable improvements in costly workflow, reallocating headcount doing things the old way, eliminating fees for outdated software, and even generating revenue. You're not a special snowflake. Your users' requirements are not as unique as you think they are. Every single law firm partner believes the firm's work environment, internal processes, client interactions, and lawyers are unique. They're really not. What's worse, too often the most vocal advocates of a unique culture have literally never worked in another environment, let alone another law firm, so their perspective is meaningless -- despite what the org chart may reflect. A software provider with 10, 75, or 175 clients facing substantially the same business challenge may have deployed numerous iterations or configurations to address unique user requirements, but the core code is substantially the same and flexible enough to adapt to hundreds of other iterations. If you research existing solutions and don't find the feature or function you seek, it doesn't mean it's not out there. Sometimes a feature isn't in the base code but is commonly configured in the customer's deployment. Many times a feature or function is on a software vendor's radar but it won't be added to the next version until enough clients express a willingness to buy. Talk to trusted providers and you may find the path to meeting your requirements doesn't require starting from scratch. Your requirements are incomplete. I can't count how many law firms I've encountered with code written to meet one specific partner's or one specific client's needs, as expressed through a vague description of desired outcomes, and ignoring all other viewpoints. Gathering business requirements and then translating them into technical specifications and then into code is a discipline, and even Agile and lean environments don't rely on coding to a single user's needs. Inevitably, if what you've coded is a good idea from which other internal users or clients would derive benefits, and it often is, the code you wrote for one specific instance -- especially if it contains hard-wired references to a specific client -- is very challenging to build upon. To scale it, you'll need to rewrite. In software development, it's better to think ahead and write modularly rather than frequently pay for one-time throwaway code. Also, capture input from all stakeholders. Countless times a partner establishes the requirements but the client, or the legal secretary, or the billing clerk, is a key influencer or user who had no voice in the development. It's no surprise why adoption rates are so low. Quality software developers capture input and seek sign-offs from all stakeholders before writing code. Your discipline is suspect. I'm sure Steve in IT is a good code writer, even though his day job is network administrator, or help desk tech. Even if he's hired specifically as a coder, one resource isn't capable of gathering requirements, translating business requirements into tech specs, writing code, testing code, documenting code, conducting user testing, training users, and fixing bugs upon release. Having Steve attend a meeting with the partner and then begin to code from his meeting notes isn't enough. Few law firms invest in quality assurance and proper load testing, and even fewer invest in virtual environments to replicate their user community experience, including testing for conflicts with other enterprise applications. I've also run into law firms with the source code housed on one machine with no off-site backup protocol, and others where only one person has access to the source code. Just as you counsel your clients to hire the right law firm for the job, look for a disciplined and experienced software developer that isn't going to make rookie mistakes. Reliance on a single point of failure is risky. We know that Steve doesn't have time to write up a summary of the business requirements let alone document his code. So what happens when Steve leaves and you need to fix or add something? Yes, of course you can find other coders pretty quickly, but their first task is to trace the existing code to figure out how things work. This takes time. And what if, as we inexplicably continue to see today, the current code base is ancient and the availability of coders fluent in that outdated language is limited? What if Steve leaves in a huff and deletes the source code, or changes the password? I recently worked with a law firm that had developed a specialized application some years prior and dozens of clients had embedded this app into their workflow -- a perfect demonstration of the value of switching costs in a business relationship. Trouble is, the partners didn't fully appreciate the role of their two software developers and laid them off during a cost-cutting exercise. "We have other people in IT who can run with this," they said, ignoring the importance of subject matter expertise and specialization in a way that they'd never apply to the firm's lawyers. Predictably, the code faltered, the clients grew dissatisfied, and the clients untangled their workflows from a suspect system. (Side note: partner profits increased a healthy amount that year even as firm revenues grew modestly, but <surprise!> profits declined the following year.) Invest in the redundancies and peace of mind that come with purchasing software from trusted vendors. The selection of a software package or provider is complex, as well it should be for enterprise or mission critical needs. Some vendors are better than others, and the size of the company or global breadth of the brand are often false indicators of competence. It's necessary to address to your satisfaction common questions and objections such as depth of domain expertise, development process, architecture and infrastructure, configurability of the software, compatibility with existing systems, responsiveness and service posture, and, not unimportantly, how likable is the team you're going to be doing business with for multiple years. And yes, the price tag on the software matters, but only insofar as it's one factor in your total cost of ownership calculation. (Side note: If you're a software vendor CEO and your team isn't incorporating TCO into its sales motion, call me. Your poorly-trained salespeople are missing opportunities to solve customer needs and close deals.) I know you're in a hurry. But if you rush to do a poor job instead of taking time to do it well, I don't think "fail fast" means what you think it means. Keep in mind, the question isn't whether you can write good software code. Let's assume you can. It's safe to assume any competent coder can produce a good software application... once. But if your business case requires this code to be supported, upgraded, reconfigured, or replicated down the road, it's healthier to start with the premise that others are better suited to provide these services in a long-term business partnership. Avoid falling into the trap of assuming that "We can do this" or "It makes my job or my team's jobs more secure" is a good rationale. The best job security comes from finding the right people with the right skills and giving them the resources they need to be exceptional. Timothy B. Corcoran served as a senior executive with several global companies and has managed numerous software rollouts. He was the 2014 President of the Legal Marketing Association and is an elected Fellow of the College of Law Practice Management. He delivers keynote presentations, conducts workshops, and advises leaders of law firms, in-house legal departments and legal service providers on how to profit in a time of great change. For more information, contact him at +1.609.557.7311 or at tim@corcoranconsultinggroup.com. Lateral recruiting has always has been an important approach for growing law firm revenue. However, in too many firms, lateral recruiting has shifted from one of many growth tactics to a critical strategy pursued at all costs. Rather than identifying a specific need to complement or augment an existing practice, and then seeking a lateral to fill that need, some seek any lateral candidates so long as they bring a sizable book of business. Keep in mind the usual economic formula for generating law firm revenue: Rates times Hours times Timekeepers. When clients both resist rate increases and demand efficiency (i.e., fewer hours), all that’s left is seemingly to add timekeepers if the firm is expected to grow. 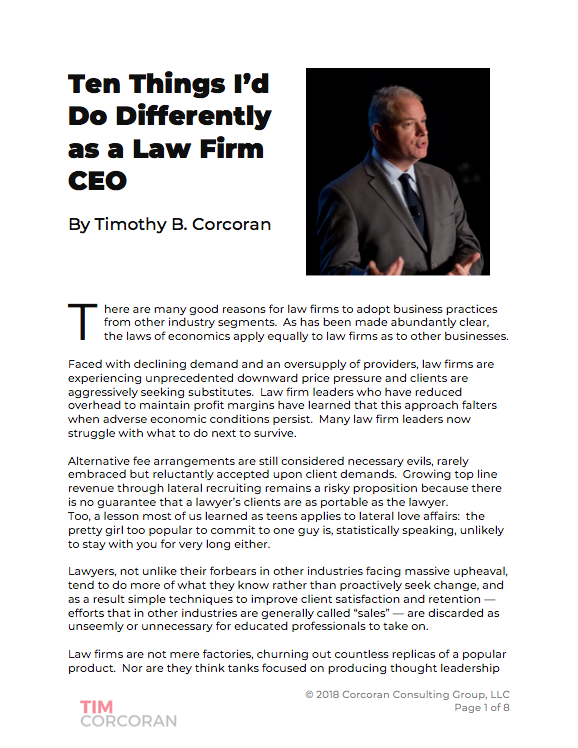 So law firm leaders breathlessly pursue a clever strategy of recruiting laterals whose books of business will take the firm to new levels of performance. Portability. We seek an established partner whose many clients are so loyal, and whose current firm culture and resources are so immaterial to client satisfaction, that all clients will immediately transfer their matters to our firm. We expect these clients to quickly become enamored with our firm, however, and never leave. Integration. We seek a lateral whose specialty perfectly matches our own practice offerings and resource mix. We expect that neither party will experience a learning curve, that there will be no material conflicts between existing clients and the laterals’ clients, that our approach to case management will be in harmony, that our billing systems will seamlessly adapt to the new clients’ billing guidelines, and our under-utilized lawyers can be immediately deployed on many new matters. ‘Til Death Do Us Part. We seek a lateral with a proven track record of transferring a book of business from one firm to another, so laterals who have jumped around a bit are acceptable. However, upon arrival we expect lateral recruits to be so enamored with our firm that they will finally settle down and never pursue greener grass elsewhere. Cross-Selling. We seek a lateral who will introduce our partners to all incoming clients, in order that we begin doing work for these clients in every area in which we practice. We will rely completely on the lateral’s assurances that he is a fan of cross-selling and has done so successfully in the past, though verifying any sort of track record is difficult. We expect the lateral to be relentlessly proactive in this regard, as our existing partners tend to ignore cross-selling unless prodded. Profitability. We seek a lateral whose practice economics perfectly mesh with our own. Notwithstanding likely meaningful differences between the lateral’s current firm and ours in size, geography, practice mix, client mix, staffing ratios, technology footprint, and resources, we anticipate the lateral’s current billing rates to be aligned with our own. We expect the lateral’s use of our resources will maintain, and eventually improve, matter and client profitability. We will scrupulously measure the lateral’s profitability, though we don’t currently calculate let alone share our existing partners’ profitability. Of course lateral recruiting is like any recruiting, and the above factors – and more – must be taken into consideration in order to find the right fit. But too often real obstacles are overlooked in the quest for revenue. Lateral recruiting is but one tactic to address an identified strategic need, not a broad strategy designed to grow top line revenue at any cost. *A version of this article first appeared in the July 2015 edition of Strategies, published by the Legal Marketing Association.